Vitamin A-rich diet: Include spinach and other fiber-rich vegetables like carrots that are easy to digest. Vitamin C-rich fruits: Citric acid is known to promote hunger in a patient. 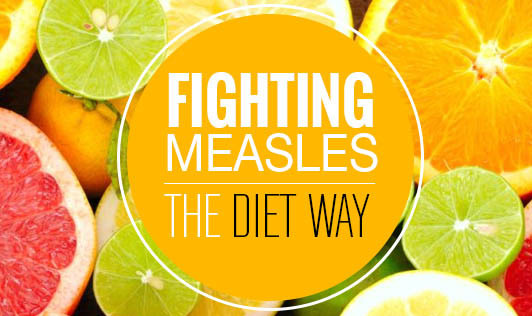 A good diet helps fight measles much better and so one portion of oranges or few spoons of gooseberry (amla) juice in the morning can charge up your system. Fresh fruit juices: The body tends to get dehydrated quickly during sickness. Hence, it is important to increase the liquid intake. Try apple and sweet lime juices. Coriander & Turmeric: Coriander improves digestion and turmeric is believed to be a great healer. Increasing these two spices in the diet can not only make food good to eat but also fit for helping your kid recover from the disease. Measles is very common in children and they tend to contract the virus really fast. But it is easy to manage. All it takes is plenty of rest and good food.